IVtags® serve as a simple and effecitive way to communicate to nursing staff. 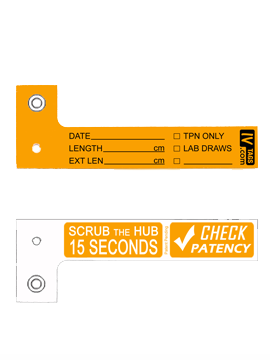 Port labeling options include many of the common line specific pieces of information, and a nursing reminder for Scrubbing the Hub 15 seconds and Checking Patency will inprove compliance to central line maintenance policy. IVtags® Communicating at the Bedside...Where Its Most Important! 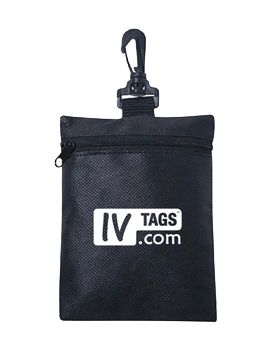 IVtags® serve as a simple and effecitive way to communicate to nursing staff. 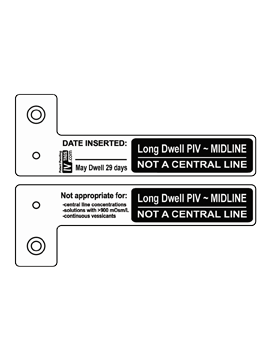 Midline/Long Term PIV tags alert and differentiate the device from a PICC or CVC. 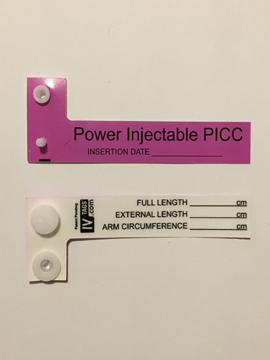 Additionaly the inserter may label the tag with the insertation date. 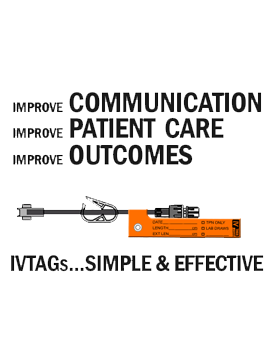 IVtags® Communicating at the Bedside...Where Its Most Important! Custom graphics to fit your needs. 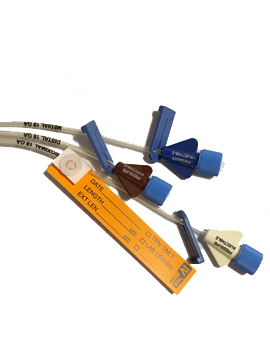 We commonly create these for a variety of devices: Dialysis, Arterial, Port, PIV, PICC, CVC, etc. 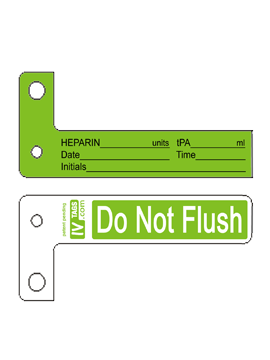 Color of tag options are shown in the PDF below. Contact us with your ideas for a free quote and mock up of graphics. IVtags® Communicating at the Bedside...Where Its Most Important! 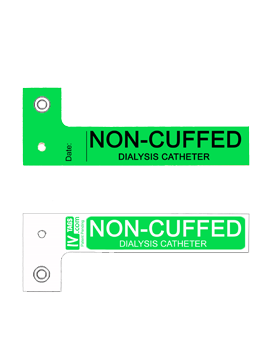 The clip-on zipper pouch clip on to vascular access carts or ultrasound machines. Makes for convenient access for tags at the time of insertion. 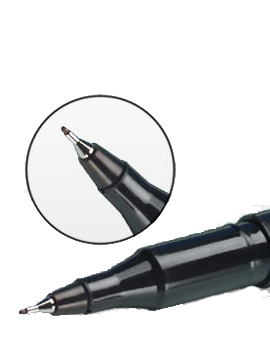 Waterproof, prep resistant markers are fine point for easy writing. After a few seconds of dry time, these Viscot markers can not be smeared or erased by any cleansing chemicals. 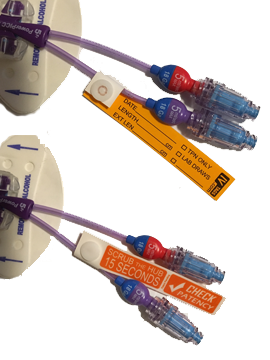 Our experience with ivtags has been that they are an exceptional way to communicate basic information about a specific line when patients are moving between levels of care and between buildings or facilities. 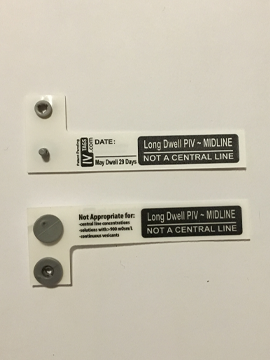 My experience with these tags has been that they are a very effective way to communicate basic information about a specific line when patients are moving between levels of care and between buildings or facilities. To revent human errors from reaching patients: Improve the effectiveness of communication among caregivers. Improve the safety of using medications. Encourage patients’ active involvement in their own care.